The Case-Shiller Index posted awful numbers in its most recent reading. Each of the index’s 20 tracked markets showed home price deterioration between September’s and October’s respective report. Some markets fell as much as 2.9 percent. The drop in values is nothing about which to panic, however. The Case-Shiller Index is just re-reporting what we already knew. It’s a common theme with the Case-Shiller Index, actually; a trait traced to the report’s methodology. The Case-Shiller Index is an imperfect housing indicator with 3 inherent flaws. The first flaw is that the index makes use of a limited data set, tracking values in just 20 cities nationwide. That data set is then projected across the more than 3,100 other municipalities in the United States. The “national figures”, therefore, aren’t really national. The second flaw is that, even within the tracked 20 cities, not all home sales are included. The Case-Shiller Index only tracks sales of single-family, detached homes, and within that market subset, it only uses homes that are “repeat sales”. This specifically excludes sales of condominiums and multi-family homes, and new construction. Lastly, Case-Shiller Index’s third flaw is its “age”. The Case-Shiller Index reports on a 60-day delay, and the values it reports are tied to contracts written even longer ago. Sales contracts from July and August are responsible for October’s closings so when we see the Case-Shiller Index as reported in December, some of the data it’s reporting is 5 months old already. That’s too old to be relevant. Looking back at 2010, housing was at its weakest between May and August. Therefore, it’s no surprise that the most recent Case-Shiller Index shows significant weakness. Looking forward, we should expect the report to improve — especially because of how strong New Home Sales and Existing Home Sales have been since summer. The Case-Shiller Index is helpful for economists and policy-makers. It’s not much good for individual homeowners, however. For accurate, real-time housing data, talk to a real estate professional instead. With 2010 coming to a close, the “experts” are out in full force, making predictions for next year’s housing and mortgage markets on business television and in the papers. The problem with housing and mortgage predictions is that — like all predictions — they’re just educated guesses about the future. 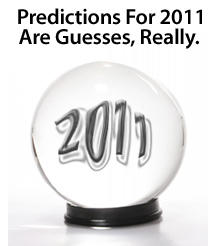 Nobody knows what will really happen with the housing and mortgage markets in 2011. All anyone can do is theorize. As laypersons, though, it can be hard to separate theory from fact. Television can make that task even more difficult at times. As an example, when a well-dressed economist goes on CNBC and presents a clear, succinct argument for why home prices will fall on 2011, we’re inclined to believe the analysis and conclusion. After all, the outcome seems plausible outcome given the facts. But then, immediately after, a different economist presents an opposite argument — that home prices will rise in 2011 — and her analysis seems sound, too. Even Freddie Mac can’t see the future. Last year, the government group predicted mortgage rates to 6 percent in 2010. That never happened, of course. Instead, conforming mortgage rates dropped over a 7-month period this year to levels best be described as “historic”. Freddie Mac couldn’t have been more wrong. So, what’s a homeowner to believe? About the only thing that’s certain right now is that mortgage rates remain low by historical standards, and that home prices do, too. Also, that both housing and mortgage markets appear to be riding momentum higher into 2011. 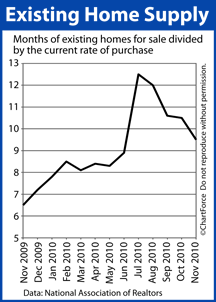 This suggests that it will be more expensive to buy and finance a home by the end of 2011. Until that time, however, predictions are just guesses. Like most housing data in November, the most recent New Home Sales report showed sales volume increasing last month, and home supplies falling. According to the U.S. Department of Commerce, sales of new, single-family homes increased to 290,000 in November on an annual basis, a figure equal to the New Home Sales 6-month rolling average, and a 6 percent improvement from October. At the current pace of sales, the national supply of new homes for sale will be exhausted in 8.2 months — a strong 0.6-month improvement from October. This data is consistent with the most recent Existing Home Sales report. It showed sales volume rising 6 percent, too, and a similarly-strong inventory drop. For the housing market , it’s another step in the right direction. Since May’s post-tax credit plunge, home prices have stabilized and a foundation for growth has been built. Home builder confidence data highlights this point. Luxury homes accounted for less than 2 percent of sales last month suggesting that builders count first-time and move-up buyers as their core market. As 2010 comes to a close, housing looks poised for a rebound. 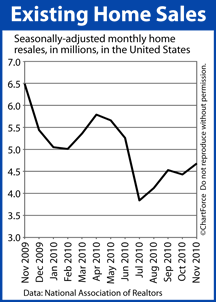 Sales in all categories are improving, relative to 6 months ago, and the economy is improving. In conjunction with rising mortgage rates, the best time to buy a new home may be now. Mortgage markets worsened again last week as the holiday-shortened sessions did little to buck recent momentum. Although Freddie Mac reported mortgage rates dropping 0.02% from the week prior, loan officers on the street will report the opposite. Rates did not fall last week. Conforming mortgage rates in Utah moved higher for 7th straight week. For rate shoppers and home buyers, it’s been a harrowing two months. Since the Federal Reserve announced its QE2 program November 3, 2010, mortgage rates have moved from all-time lows to 7-month highs. Mortgage payments now cost $38 more per month per $100,000 borrowed as compared to the day before the stimulus was announced. Mortgage rates look poised to increase again. Here’s why. A major reason why mortgage rates were so low, for so long, was that the U.S. economy was suffering. Consumer spending was slow, business forecasts were dour, and job growth was negative. These conditions lasted for longer than a year. And, furthermore, housing appears to be on solid ground. Existing Home Sales and New Home Sales improved last month, and home supplies are dropping. This, too, is good for the economy, which, in turn, is bad for mortgage rates. This week, don’t be surprised is mortgage rates rise again. The week is again shortened by holiday and there’s a host of new data that may signal economic improvement including Pending Home Sales, consumer confidence surveys and the Case-Shiller Index. Existing Home Sales jumped another 6 percent in November, the report’s third month of improvement since bottoming in July. According to the National Association of REALTORS®, a quarter-million more existing homes were sold during the annual period ending in November as compared to October. An “existing home” is a home that cannot be considered new construction. Additionally, the national housing supply dropped by a full month. At the current pace of existing home sales, the complete stock of homes for sale will be exhausted in 9.5 months. November’s strong housing data is yet another signal to buyers that the housing market’s foundation has been rebuilt, and that a rebound is imminent. It’s helped that there are great “deals” on which for buyers to pounce. In November, short sales and foreclosures accounted for one-third of all existing homes sold, and carried an average price discount of 10 percent and 15 percent, respectively, as compared to non-distressed sales. Repeat buyers continue to power the market, too, representing more than half of all home buyers. This breakdown suggests that housing has regained its footing. First-time buyers can’t support a market long-term like repeat buyers can and, as compared to 12 months ago, the percentage of repeat buyers is now up 14 points. Home buyers take note. Raw sales volume is rising and available inventory is dropping. Basic supply-and-demand tells us that this will lead home prices higher. Furthermore, mortgage rates are rising quickly, increasing the cost of homeownership. If buying a home is a part of your plan for 2011, consider accelerating your purchase time frame. Existing homes account for more than 80% of homes sold nationwide. If the market keeps improving like this, your home affordability will worsen. The number of single-family Housing Starts increased in November, adding 30,000 units as compared to October. 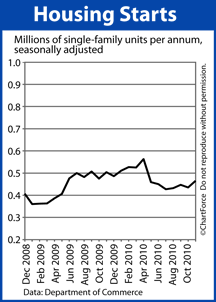 The Census Bureau defines a “housing start” as a home on which construction has started. November’s starts represents a 7 percent increase from the month prior. However, if you see the Housing Starts story online or in the papers, you’ll notice that the press is calling the market gain at 4 percent. So which result is right? The answer is both. The government’s monthly Housing Starts data is published as a composite report; lumping activity among 3 separate housing types into a single, group reading. The group reading is a fair description of the market and it’s easy-to-understand. As a result, it’s what the press tends to report. However, for home buyers in Utah , it’s the single-family category that’s most relevant. The reason why single-family homes accounted for 84% of November’s Housing Starts is because that’s the type of home that most buyers buy. Few purchase 2-4 unit properties, and even fewer buy entire apartment complexes. That said, it’s possible that November’s Housing Starts data is wrong. Within the press release, the government placed an asterisk next to the data, indicating that the figure’s margin of error exceeds its actual measurement. Against a 7 percent gain, the reported margin of error is 13.5%. There is no statistical evidence, therefore, to prove the actual change was different from zero. If Housing Starts did fall in November, it will help to reduce the housing inventory, which will, in turn, help keep home prices high. For home sellers, this could mean good news. Fewer homes for sale increase competition among buyers. Foreclosures tend to be sold at discount and low home prices can entice home buyers to make an offer. 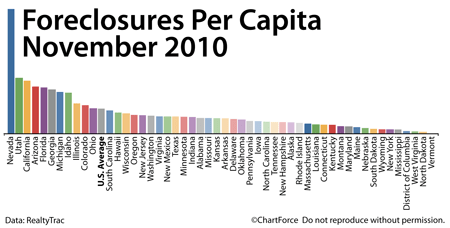 If you’re such a buyer and want to look at foreclosed homes, talk to a real estate agent first. Mortgage markets worsened again last week as belief in a U.S. recovery and concerns for inflation took hold on Wall Street. Conforming mortgage rates rose in Utah for the 6th straight week. According to Freddie Mac’s weekly Primary Mortgage Market Survey, the average 30-year fixed rate mortgage is 0.66% higher this week as compared to rates on November 11, but loan originators will tell you that figure is understated. Real mortgage rates — mortgage rates available to everyday homeowners and buyers are up by as much as a full percentage point since November, and loan costs are rising, too. The Refi Boom of 2010 is over. Last week, mortgage markets revolved around the Federal Open Market Committee. The FOMC met Tuesday and voted to leave the Fed Funds Rate unchanged within a target range of 0.000-0.250. This was expected. However, markets seemed to be surprised by the Fed’s take on inflation. In its press release, the Fed said inflation is running too low to benefit the economy. Its policies, including the group’s $600 billion bond market program, may be meant to spark inflation, then. This would lead mortgage rates higher and Wall Street knows it. Mortgage rates spiked after the Fed adjourned. This week, with a sparse data schedule and trade volume thinning because of holidays, expect mortgage rates to be volatile. 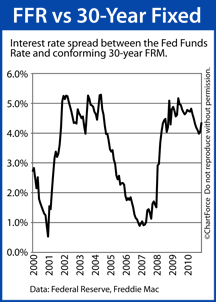 Although rates are higher since 7 weeks ago, they remain low, historically. There’s still a chance to capitalize on the lowest mortgage rates in decades. If you haven’t refinanced this year and want to know what’s available, talk to your loan officer right away. Home builder confidence is holding firm this month, according to the National Association of Home Builders. The group’s monthly Housing Market Index survey posted 16 for December. That’s the same value as from November. It’s also equal to this 2010’s average HMI reading. HMI is scored on a scale of 1-100, and is a composite of 3 separate home builder surveys measuring single-family sales; projected single-family sales over the next six months; and prospective buyer foot traffic. Values of 50 or better indicate favorable conditions for home builders. Values below 50 indicate unfavorable conditions. In other words, although improving, conditions for home builders remain less from excellent. Home buyers can use this to their advantage. When builders feel pressure from the market, they’re more likely to offer discounts. On the other hand, job growth is returning, the economy is expanding, and mortgage rates are rising. These 3 factors are thought to boost housing markets. 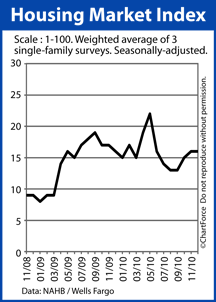 So, despite an unfavorable HMI reading, home builders might still less willing to “make a deal”; holding out for a better 2011. November’s strong Housing Starts data supports that line of thinking. 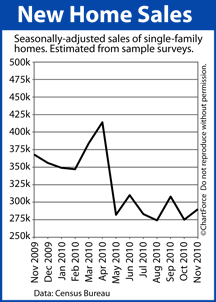 If you’re buying a newly-built home , or expect to buy sometime in 2011, keep an eye on home builder sentiment surveys. The better the builders feel, the more you may be asked to pay to buy your next home. Loan-level pricing adjustments are mandatory loan fees based on a borrower’s specific default risk. First introduced in 2008, LLPAs were Fannie Mae’s and Freddie Mac’s logical response to massive balance sheet losses. At the time, the housing market was deteriorating and mortgage delinquencies were rising. To “better align with loan risk characteristics”, the two entities created specific fees to be associated to specific loan traits, to be charged to all borrowers. LLPAs are still in existence today. In many respects, loan-level pricing adjustment are similar to auto insurance. All things equal, the driver of a “fast” car will pay higher costs than the driver of a “safe” car. The same is true for mortgages. 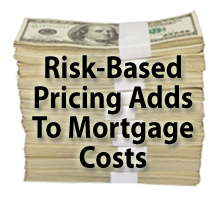 Loan-level pricing adjustments are public information. Fannie Mae publishes the complete LLPA matrix on its website. The chart can be confusing, however. If you have questions about how LLPAs work, talk with your loan officer. You are currently browsing the KeithSargent's Blog blog archives for December, 2010.